It’s been pretty cold across the country…colder than here, anyway. Still, the schools have been closed, and the kids have become habituated to snow days. My entire family has become fly tyers this winter. Mix in some snowshoes, skis, warm fires, a few books…it hasn’t been entirely unwelcome to let the weather run the show. And then, on the horizon, a sudden — and brief — respite. This weekend looks good, great, fantastic. Highs in the 30s on Saturday, temperatures increasing overnight, and 40s on the Sunday. As bad as it feels right now, this weekend is going to be beautiful, and it’ll fish, at times, pretty beautifully as well. That’s the good news. The bad news is much of the river is frozen shut. I wouldn’t trust any float below Townline Road. I wouldn’t even think about driving into the South Branch (though I would throw my waders into a backpack and snowshoe or ski into it). Much of the North Branch is currently frozen. 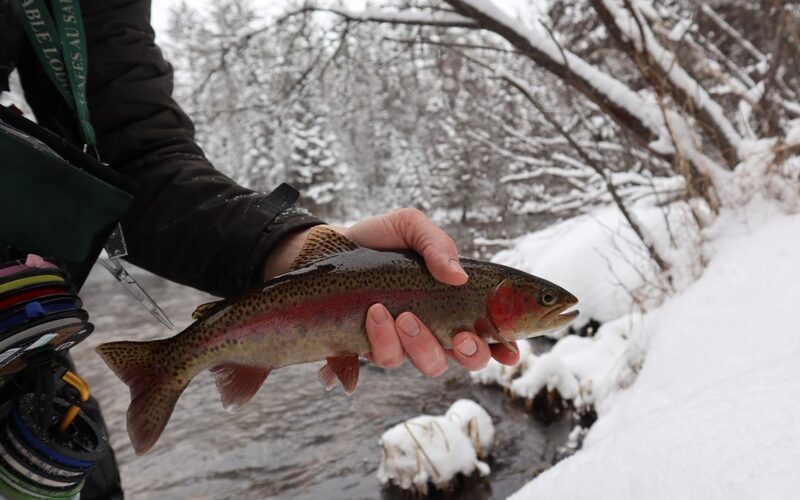 This leaves the Holy Waters and accessible stretches of the South Branch as the only decent options to get some winter fishing in. And that’s okay. It will be enough. Around four pm I began to catch some rainbows. They were dark with pre-spawn, and full of jump despite the water temps. I used a pretty standard bead head jig fly as an anchor and Saunders’ Stony Baloney — don’t try finding that one in a fly catalog, but it is in the fly bins at the shop — were good. Would different flies have worked? Probably. But it was just cold and snowy enough to convince me to stay with the same set-up. We had a great weekend this past weekend, cold be damned. One couple came up to ski and fish. 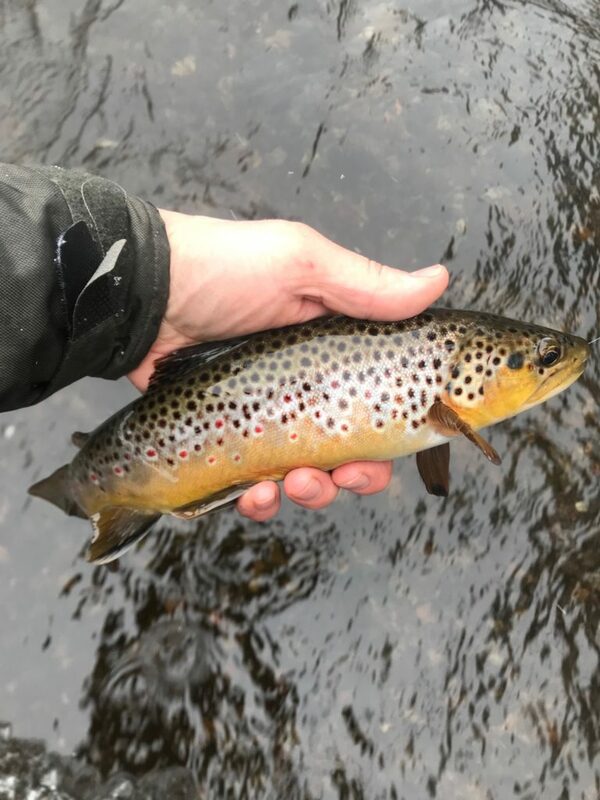 They became engaged on a ski into the Mason Tract, and the next day the fella went fishing in five degree temperatures (seriously) and managed a fine brown trout in front of the lodge. That’s making the most of the situation. This weekend we have another full card of meals and events, and still a few empty rooms for what looks to be an awesome time to be by the river. 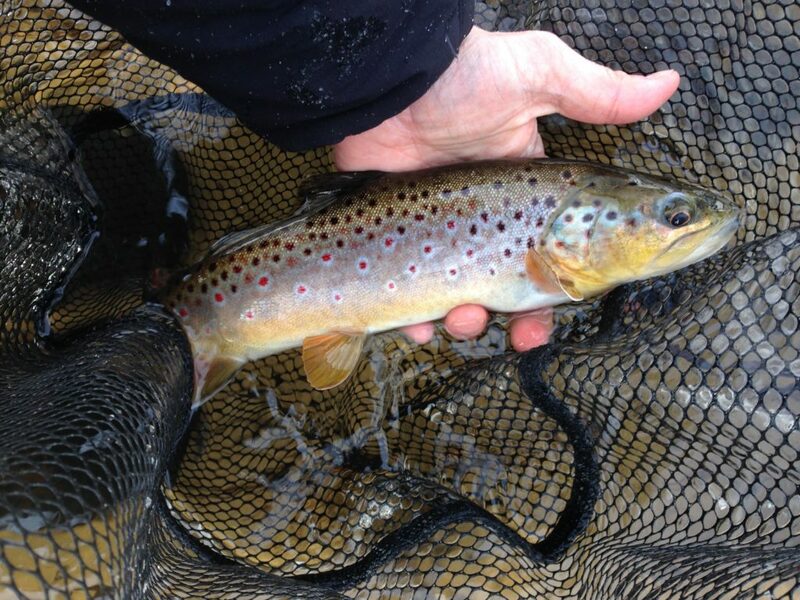 Give us a call for a fly tying, skiing, fishing, foody (serving dinners and breakfasts this weekend). You’ll have a blast. 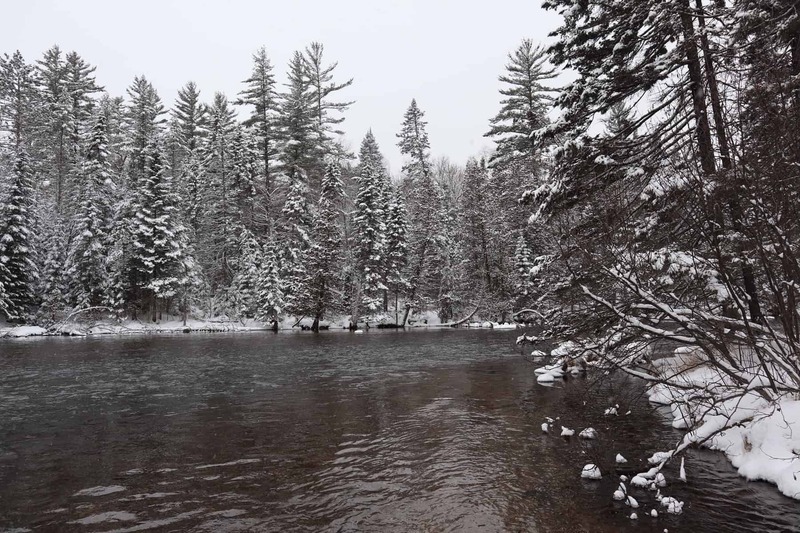 Nymphing the Au Sable, Sunday, February 3rd, 10 am – 12 pm: Dennis Nelson will be teaching an impromptu nymphing class from 10 am – 12 pm on Sunday morning. Spots are very limited for this class, but we want to make the most of the weather and show people how we do this winter nymphing thing. This class involves wading, and cold weather gear is imperative. We have a full range of hats and gloves in the shop if you need to add to your winter arsenal. $75/person. On Saturday morning we’ll be cranking bugs from 9 am – 1 pm during another installment of our Free Fly Tying Saturdays. Instruction, food, and flaming woodstove are included. We have vises and tools for folks who are new to the craft of tying flies. We have taught a ton of people to tie flies during these Saturday morning sessions over the last ten years. Saturday night’s class with Matt Verlac is full but we’ll have more featured tyers on February 23 and March 2 weekends, details coming soon.